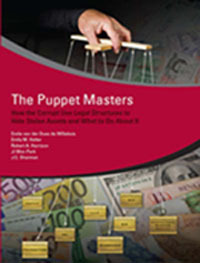 (The Economist) : A new report by the World Bank called “The Puppet Masters” has investigated some 150 cases of what it calls “grand corruption”, with a total of $50 billion in illicit assets. Nearly all involved use of companies in which the real ownership was concealed, and of bank accounts, often in respectable countries . The United States is “by far the worst performer” of the countries reviewed. As a test, one of the authors set up a firm in Nevada with a nominee director based in Panama, complete with an American bank account. All he needed was an unnotarised copy of a driving licence (which showed an out-of-date address) and $3,695. The report recommends tightening the definition of “beneficial ownership” to focus on the control exercised over a company and the benefitderived; the end point should always be a human being, not another legal entity. Banks and companies providing registration services should widen their due diligence to include this. Nominee directors should disclose whom they report to. Complex structures with more than three layers of ownership should arouse especial scrutiny and have to explain themselves. Other recommendations are that company registries should be searchable online and operators should make an effort to verify the information supplied.